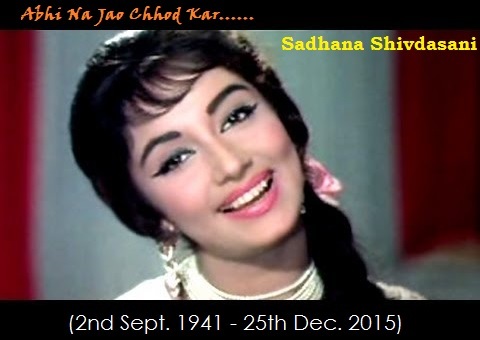 Veteran actress Sadhana Shivdasani passes away at Hinduja hospital, Mumbai. She was 74. Sadhana Shivdasani, she was one of the top actors of the 1960s and 70s. She is remembered for her roles in blockbusters like Love in Simla, Hum Dono and Arzoo including evergreen musical hits Abhi Na Jao Chhod Kar (Hum Dono), Jhumka Gira Re (Mera Saaya). However, it was the Sadhana cut, a hair style first fashioned by her in the early 1960s, that made her name a part of popular Indian culture. Born in a Sindhi family in Karachi, British India, Shivdasani was named after her father's favorite actress-dancer Sadhana Bose. Her father was the brother of actor Hari Shivdasani, father of actress Babita. The family fled from Karachi during the post-Partition riots and settled in Mumbai. Her mother home-schooled her until she was 8 years old after which she studied at Auxilium Convent, Wadala and Jai Hind College.